Wallace Mukupa from Zambia was awarded the 2016 FIG Foundation PhD scholarship for his research project: structural change detection and deformation monitoring. Wallace is currently in the final stages of his PhD studies at the University of Nottingham, Ningbo, China. He was the recipient of this scholarship during the course of his PhD studies in autumn of 2016 at the commencement of his fourth and final year of his research. "I was delighted to receive a scholarship from the FIG Foundation and it goes without saying that this scholarship helped to lessen the financial burden on me since I received it at a time when I needed one” says Wallace. The scholarship was used to cover part of the research expenses and lodging fees. “Without the unceasing dedication, drive, passion and the scholarship, my success would not have been possible. I am fortunate to have been offered this scholarship, as without it, university education would have been far more costly and possibly unattainable. I think my progression over the past months has been tremendous in part because of the peace of mind afforded by the FIG Foundation scholarship that I was awarded; I could focus on being the best researcher I could be without worrying about finances,” says Wallace. Mukupa, W., Roberts, G.W., Hancock, C.M. and Al-Manasir, K. 2017. Correction of Terrestrial LiDAR Data Using a Hybrid Model. In: Proceedings of the FIG Working Week, Helsinki, Finland, 28th May - 2ndJune. "I have striven to achieve as much as possible in my academics, and my hard work has certainly paid off. If not for hard work and the scholarship award, I wouldn’t have been able to be where I am today. Words cannot rightfully express my gratitude. While there was hard work and a price-tag on what got me to where I am today, being on the perfect path to my future is priceless” says Wallace. 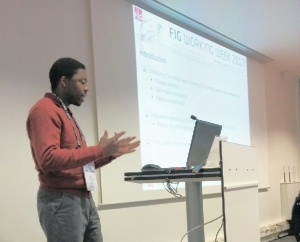 Wallace was able to attend the 2017 FIG Working Week in Helsinki, Finland, since he qualified to be awarded the travel grant that the FIG Foundation had ring-fenced for a successful PhD scholarship applicant in order to attend and present a peer reviewed paper at the FIG conference. He had a peer paper accepted for oral presentation at the FIG conference, entitled “Correction of Terrestrial LiDAR Data Using a Hybrid Model.” This paper was scheduled in the technical session: TS03F - Engineering Surveys for Constructive Works and Structural Monitoring. In addition to the technical session, Wallace also participated in the technical tour to National Land Survey of Finland. 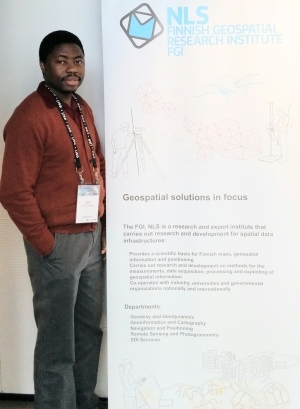 Wallace stated that his presentation gave him exposure to the wide surveying community since the FIG Working Week is the leading international conference for surveying and it brings together academics and surveyors across the globe to share and discuss new approaches to surveying. “Attending the FIG Working Week was a professionally rewarding experience. In addition to socializing with colleagues from other institutions, the main reasons I intended to attend this conference which is so important to my research area were to present a paper, hear presentations and to converse with other researchers in the same field. Listening to presentations informed me of what others are doing and even more clearly than just reading their papers, and like in any event with a slightly different spin and the ability to ask questions. Even though listening to the talks is extremely valuable, hallway conversations were even more fruitful and so I did everything I could to cultivate such conversations. The conference inspired my research interests and exposed me to different styles of excellent presentation. By attending other presentations, I was able to learn from others and improved my own skills and knowledge about my field. It was really important to engage with the work of others and ask questions. Like in any other profession, networking is very important in my field” ends Wallace. FIG and FIG Foundation thanks Wallace Mukupa and wishes him all the best in his future carreer and hope to see him at future FIG conferences.